“An injury to one worker, is an injury to all,” Deputy President Cyril Ramaphosa roared from the stage from the Congress of South African Trade Unions (Cosatu) Central Committee meeting In Pretoria, at the end of May 2017. I waited for someone to yell “Marikana,” or perhaps throw a shoe, but the Cosatu affiliate unions lapped it up. Ramaphosa lavished praise on their efforts as the country’s largest labour federation, their negotiating prowess at the National Economic Development and Labour Council (Nedlac) and their history fighting for workers. Of course, Cosatu was the first structure of the tripartite alliance to support the former unionist turned politician, turned billionaire businessman, in his bid to become African National Congress (ANC) president at the party’s elective congress in December later this year. This was not the crowd to raise the white hot anger, still burning inside thousands of Marikana mineworkers, or the family members who spit with indignation when they speak about the “Butcher of Marikana”. Ramaphosa was elected as ANC Deputy President at the party’s congress in December 2012, four months after his role in the largest massacre of workers, post-democracy, was revealed. Nearly five years later, ANC members who support him appear to be genuinely puzzled why Marikana is still linked to him. Cosatu leaders say publicly that the Farlam Commission of Inquiry set up to probe the deaths of 44 people that fatal August, cleared him of wrongdoing and they believe he, as a former unionist and one of the negotiators for the democratic constitution, is the best person to advance workers’ rights. Privately, Cosatu affiliate leaders will mutter “he’s the better devil” (than former African Union Commission Chair Dr Nkosazana Dlamini-Zuma) and the ideologues within the ANC’s labour ally maintain that the working class has yet to build a strong enough candidate to represent them and, so, must settle for Ramaphosa. Narrowing the debate to whether retired Judge Ian Farlam cleared Ramaphosa or not, and whether his infamous “concomitant action” email is the smoking gun, discards much of the valuable testimony that was presented slowly and painstakingly, during the two years of the Farlam Commission. As the country learnt with President Jacob Zuma, the letter of the law might absolve the person, but the spirit of the law, and perhaps even further, what is expected of leaders, goes beyond these narrow confines. The ANC itself claims to have loftier ideals for leadership positions, with the “eye of the needle” policy document a benchmark for potential leaders. Lately, Ramaphosa has made his way around the country, addressing memorial lectures, religious events and anybody who cares to listen. He has talked up the necessity of responsible and accountable leadership. Here, he has been dealt a long straw, as anybody compared to the continuing disaster that is Zuma, appears to have a semblance of moral fibre and strong leadership skills. He is also pushing a strong anti-corruption message, hammering home the need for a judicial commission of inquiry into state capture, which of course fits in neatly with the narrative he wishes to project: of being Zuma’s polar opposite. But is he really? There are at least 4 instances while he was non-executive director at Lonmin PLC and particularly in the days leading up to, and after, the deaths of the 44 workers in August 2012, when he dismally failed to show the type of leadership skills he promises will be the panacea to the country’s ills. Mine closure- Cyril Ramaphosa was not an ordinary non-executive director at a large corporate. His career was founded on his trade unionist skills, as someone who built the previously formidable National Union of Mineworkers (NUM) from the ground up. He had led several strikes between 1982 and 1990, including the longest mineworkers’ strike in history, in 1987. As the general secretary of the NUM, he demanded management close mines during industrial action, to prevent violence against non-striking workers. Lonmin insisted on keeping its operations open during the 2012 unprotected strike — despite the death toll rising almost daily — and Ramaphosa, with all his union experience, didn’t utter a peep. Instead he pushed for a larger police deployment when a labour solution was clearly required. The evidence leaders at the Farlam Commission, in their closing arguments argued Ramaphosa acted to further his own financial interests (Shanduka’s shares were under pressure at the time, with the share price falling) and he, together with senior police officials, as well as the then NUM president, Senzeni Zokwana, acted to protect the NUM, which was afraid of becoming irrelevant on South Africa’s platinum belt. Negotiate with striking miners- at no point during his interactions with Lonmin Chief Operating Officer Albert Jamieson, in the critical days leading up to 16 August 2012, did Ramaphosa suggest the world’s third largest platinum company speak to its employees to try resolve the impasse. Lonmin’s vice-president for human capital and external affairs, Barnard Mokwena called the striking miners “faceless” and claimed the company didn’t know them, which was a convenient method for dismissing their demand for a R12 500 “living wage”. As a former trade unionist, from the mining sector at that, Ramaphosa should have immediately recognised the need for Lonmin to acknowledge their own employees. He told the Farlam Commission, he’d wanted to secure the situation by calling for more police, before suggesting the company negotiate with its own workers. Advocate Dali Mpofu SC, who represented the injured and arrested mineworkers at the commission, maintained as a former NUM leader, Ramaphosa should have known the manner in which police incite violence during a strike, especially when people feel unheard and neglected. Mpofu described the 1922 Rand Rebellion by 22 000 white miners who were demanding higher wages. The government then, sensing the threat to a major economic sector, deployed the army, which resulted in 153 miners being killed, 500 injured and 5 000 being arrested. Mpofu argued the Rand Rebellion should have been treated as a labour dispute, without the state interfering on the side of the employer. He pointed out how the post-democratic government had adopted the same policy with the striking Marikana miners. In one of the most bizarre and macabre moments during his testimony, Ramaphosa used a lull in proceedings, while activists shouted “blood on his hands”, to clean his teeth with a toothpick. The Farlam Commission found that Ramaphosa “had no reason to believe that the South African Police Services would launch the precipitate, ill-planned and poorly commanded operations, which led to the deaths of 34 miners”, and that there was no prima facie case to link him to the police killings. But, as the outrage continues over the Gupta family’s influence over the state and key politicians working in their business interests, Ramaphosa’s leveraging of his own political influence as former ANC secretary general and a member of its powerful national executive committee (NEC) to further his own agenda demands close examination. He disingenuously told the Farlam Commission that anyone could have phoned the police minister at the time (Nathi Mthethwa, who was his junior in the ANC), and demanded action be taken against the criminal activity in Marikana. Ramaphosa is clearly living in an alternative South Africa since, as most citizens know, police stations don’t even answer their phones. A conversation between North West Police Commissioner Zukiswa Mbombo and Mokwena was secretly taped the night before the disastrous police operation, which resulted in their killing 34 striking miners. That transcript shows Mbombo telling Mokwena that both Mthethwa and the National Police Commissioner Riah Phiyega told her of their being pressurised by the Lonmin shareholder to end the strike forcefully. Mbombo stated she had to prevent “political opportunism” by people such as ANC Youth League president Julius Malema and Themba Godi of the African People’s Convention. Mbombo later denied this under oath at the commission. Tellingly, it was Ramaphosa’s own cabinet colleague that provided a glimpse into his behaviour that week in late winter, 2012. When the former Mineral Resources Minister Susan Shabangu testified at the Farlam Commission, she denied Ramaphosa’s previous statement, which he had made under oath that she had agreed to change the classification of the strike from a labour dispute to a criminal issue. Whether Shabangu took the step of accusing South Africa’s deputy president, and her boss, of lying, with a view to the 2017 ANC leadership race, or to save her own skin, is anybody’s guess. She then volunteered the information that Ramaphosa has been trying to impress his fellow Lonmin board members by showing his influence amongst politicians (something which the Gupta family has been rather fond of doing, too). The Farlam Commission report noted the discrepancy between Ramaphosa and Shabangu’s testimony, but was unable to resolve who’d been lying under oath, as Ramaphosa was never called back for re-examination. The Farlam Commission found that the 2012 strike could, in part, be blamed on the woeful housing situation the mineworkers and their families endured. Ramaphosa was appointed as head of Lonmin’s transformation committee in 2010 as part of his duties as non-executive director. That year his company, Shanduka, had acquired a 9% stake in Lonmin as part of the latter’s Black Economic Empowerment (BEE) targets. Shanduka was paid R250 000 a month to advise Lonmin about transformation. The Legal Resources Centre’s Advocate Tembeka Ngcukaitobi, who represented a family of a slain mineworker, argued the Department of Mineral Resources had renewed Lonmin’s mining rights, in 2008/2009, based on its Social and Labour Plan (SLP), which promised to build 5 500 homes by 2011. Only three show houses were eventually built. Ramaphosa who was confident, to the point of arrogance, during much of his two days in the stand, retreated somewhat under the relentless cross examination by Ngcukaitobi. He admitted he’d never read a single transformation committee reportregarding the lack of SLP fulfilment and had delegated someone else to do it. He told the commission that he sat on the board of multiple companies and didn’t have the time to pay attention to his fiduciary duties. Ramaphosa then blamed Lonmin’s financial ill fortunes for contravening the legally binding contract. Ngcukaitobi replied that the platinum giant had been paying dividends to its shareholders during this period. Ramaphosa was then forced to admit the housing failures were an “under performance” and Lonmin had “under achieved”. The deputy president, still in the stand, attempted to invoke sympathy, explaining how difficult it was, as a minority shareholder, to make a meaningful difference to mineworkers’ lives. Ramaphosa told the documentary Miners Shot Down that it was difficult for him, as a BEE shareholder, to intervene in transformation matters, yet he failed to explain why his company, Shanduka, accepted the R250 000 monthly, or indeed why he retained his role as head of the transformation committee if he felt he was unable to do this. Shanduka’s bid to buy Lonmin shares was preferred over the community to which the land belongs, the Bapo Bo Mogale. Ramaphosa was seen to have BEE credentials and as a former labour and political heavyweight, it was assumed that he could add a veneer of transformation to the company. Ramaphosa’s acknowledgments of his failures show the inherent weaknesses in BEE policy because of the strong corporate culture already in place in many companies and partly due to his own apparent unwillingness to take unpopular positions within the board. This is an important aspect to consider as the country considers the wreckage Zuma leaves behind and searches for a potential successor. Zuma has been accused of failing to stand up to the Guptas and his son Duduzane’s greed and excesses. Yet, there’s no indication that Ramaphosa has been able to withstand pressure from external forces, despite knowing this will adversely impact thousands of people’s lives. Directly after the 2012 massacre, Ramaphosa’s presence at several events was met with protests by small groups of activists. While fresh scandals have emerged to enrage the public he continues to faces criticism and questions, from some quarters, over his role in the Marikana massacre. As the race for the ANC’s presidency heats up, Ramaphosa is clearly uncomfortable at the thought that there are people who see him as callous and cruel at best, a murderer at worst. The ANC membership has long forgiven him, electing him deputy president in 2012, before the Farlam Commission had released its report. While he was campaigning in the North West last year, I asked him whether his schedule deliberately circumvented Marikana. He replied with an easy smile, and said that he’d campaign there anytime. He is yet to go there. Ramaphosa’s apology so far, has been for the benefit of the media, ANC members perhaps, but not aimed at the people it actually affects, the families of the 44 victims who died in August 2012 and the 278 mineworkers who were injured and/or arrested during the police operation. Many of the mineworkers and their families are spread out in the North West, the Free State, the Eastern Cape and in Lesotho and Swaziland. A true commitment to apologise would include visiting them all (approximately 360 people were directly impacted by the deaths of the 34 striking miners). This is what they ask for in their civil cases against government. Compensation and closure, a desire for the pain and suffering they’ve endured, to be acknowledged. Cyril Ramaphosa is the first ANC presidential contender, since democracy, to neither have been in exile, nor imprisoned on Robben Island. As a student activist in the 1970s, at the University of the North (Turfloop), he was affiliated to the Black Consciousness Movement. He was detained twice for political activities, once for 11 months, and again for 6 months. The History of Black Mineworkers Vol III by VL Allen details how the Council of Unions of South Africa (CUSA) resolved to form a mineworkers union in 1982 and enlisted Cyril Ramaphosa, who was a recent law graduate, as the point person for this. CUSA was aligned to the Black Consciousness Movement and the ANC in exile was suspicious of its motives, but the leaders in exile decided that any union organising mineworkers would be a progressive force and workers should not be divided. The ANC’s visionary leadership in 1982 can be contrasted with the defensive and hostile position it has taken towards the NUM’s rival, the Association of Mineworkers and Construction Union (AMCU), since 2012. 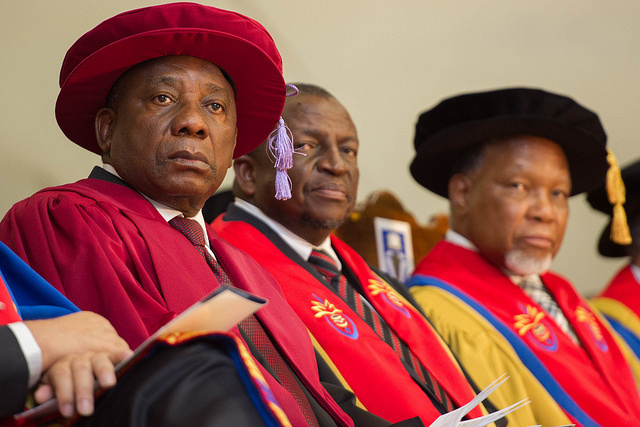 During the early days of NUM’s formation, it is not impossible to think Ramaphosa must have imagined his life could have been comfortable and easy if he’d taken a job as a law professional. But the initial years, when he struggled to establish the union, allows a glimpse into his never-say-die attitude and his refusal to give up or back down. The mining union had little funding as mineworkers were skeptical of handing over their subscription fees immediately, having been duped by insurance salesmen in the past. Ramaphosa and his handful of recruiters used an old kombi van to drive around to the mines to distribute leaflets. They were frequently chased away by the police, as most companies had not granted them organising rights. In addition to this, Ramaphosa was treated with suspicion by CUSA comrades, who resented his success at recruiting mineworkers and the fact that he’d rarely been underground and, was in fact, a trained lawyer, not a worker leader. At the NUM’s inaugural congress in December 1982, Ramaphosa was elected general secretary. He had to contend with workers who had never attended a congress, many of them illiterate and who had to be coaxed through the processes. The debate over the name lasted nine hours, in part because Ramaphosa didn’t want to exclude non-South Africans or non-Africans with the title. He had begun to grow disillusioned by the Black Consciousness Movement and the NUM became a union for all nationalities and all races under Ramaphosa. He worked to try remove the ethnic and national differences amongst mineworkers, which had been used to sow divisions by mine managers. Ramaphosa went on to help found Cosatu in December 1985 and the NUM became the largest union in the country. In the 1970’s, mining contributed 21% to South Africa’s GDP and employed over a million people, proving its importance in the economy. Politically, three ANC secretary generals have come from its leadership ranks: Kgalema Motlanthe, Ramaphosa and Gwede Mantashe. The first two also served as the ANC’s deputy president. Ramaphosa’s work in negotiating the constitution, his move to politics as ANC secretary general and his abrupt departure to business, as Thabo Mbeki’s ascension to the deputy presidency in 1994 thwarted his own ambitions have been well documented. Today, the NUM, which is arguably Ramaphosa’s single strongest legacy, is a shadow of its former self. It is the third largest union in Cosatu (behind two public sector unions), as a result of massive retrenchments in the mining industry with mining now contributing 7% to the country’s GDP and competition from rival AMCU, who capitalised on the union’s failures on the platinum belt in 2012. It appears Ramaphosa did not learn from the devastating consequences of putting his personal interests ahead of the mineworkers in 2012. Despite his testimony at the Farlam Commission looming, he tried to prevent the conclusion of the longest post-aparthei strike in South Africa — the 2014 platinum strike — as he appeared not to want the AMCU to upstage the NUM. According to people who were involved in the negotiations, this is what took place: The first thing former mineral resources minister Ngaoko Ramathlodi did, after being appointed in May 2014, was to attempt to resolve the protracted platinum strike. It later emerged he was so busy with this that he was spared a dinner invitation from the Guptas dinner. President Zuma, freshly re-elected at that stage, was still concerned about the country and the economy. He told Ramathlodi to solve the strike “at all costs” — even to the detriment of the NUM’s future on the platinum belt and perhaps even as a mining union. Ramathlodi tackled the strike energetically, he was respected and completely objective, bringing all the parties around the table. He appeared to be making some headway. AMCU and the others were amazed he was being allowed to do this as government’s dislike for upstart union is well known. As an example, former mining minister, Susan Shabangu, denied knowing the union at the Farlam Commission, despite it being several years in existence. So talks were progressing and there was a faint glimmer that the strike could be resolved. The strike was taking its toll on the workers, who were sinking into debt, the Rustenburg area which is reliant on the platinum economy and the country’s GDP. Visiting the area at the time, people told me they could hear hungry children crying at night. Schools reported low attendances and charity Gift of the Givers handed out food parcels to avoid starvation and malnutrition. Mantashe’s dislike for AMCU president Joseph Mathunjwa is personal, but Ramaphosa, who had just been appointed deputy president and leader of government business, was willing to play Russian roulette with the lives of thousands of workers and their dependents, and the entire economy, to try prop up a flailing NUM. Ramaphosa is currently trying to appeal to the business sector, yet he was willing to allow the strike to drag on, costing the three platinum producers a total revenue loss of R24 billion — a figure the deputy president appeared hell-bent on escalating. devote myself to the well-being of the Republic and all of its people. Happily, the negotiating partners had foreseen Ramathlodi would be barred from facilitating the talks and when he pulled out the day after the NEC meeting, negotiations continued and the strike was resolved just over two weeks later. AMCU was seen as the better union to join as it had negotiated the iconic demand of R12 500 to be reached within three years. The NUM’s numbers dipped even further on the platinum belt and AMCU became a serious competitor in the gold sector. It’s interesting observing the deputy president with ordinary people. Zuma is well known for his charm and Ramaphosa can certainly give him a run for his money in this department, but unlike the president he changes his messaging, his tone and even his posture, subtly, depending on the occasion. Ramaphosa has fewer bodyguards than Zuma and his security is not as paranoid, giving him a more “normal” or approachable air. Going door-to-door in Tembisa on the East Rand, during a 2016 municipal election campaign, he walked down the streets with his feet in a sort of “duck position”. This almost made smaller. He wore a bemused smile on his face, as if to say he was not quite sure why so many people, including armed bodyguards, were milling about. He gave the appearance of just trying to have a casual chat while walking down the road. Rewind to the 2014 national elections, when Ramaphosa addressed a group of professionals in Sandton, he broke the ice by recounting the story of how he had to represent Zuma at a church service in a tent, in a rural community (he was still singing Zuma’s praises back then). He poked gentle fun at the devout, rustic congregation, establishing an instant rapport with the urban crowd he was addressing. Occasionally, his genial mask slips, but only momentarily, before he remembers someone could be watching. Ramaphosa went to Rustenburg in July 2016, to conduct damage control, after a week of EFF leader Julius Malema’s campaigning there before the municipal elections. He ate lunch in a humble samosa shop, on the edge of town, as part of the ritual politicians perform everywhere: to show they too are normal people (in election years). He was preparing to address the media outside when a curious onlooker (his security is definitely relaxed) came right up to him to voice his complaints about housing in the area. Ramaphosa tried to brush him off by saying “we’ll fix it” but the man was insistent, did the deputy president know the area, ward, street he was talking about? Ramaphosa, kept muttering “we’ll fix it”, until the resident was elbowed out by security. The deputy president quickly fixed his smile, ready for the cameras. His chameleon-like abilities have also been on display amid the recent furore surrounding the new Mining Charter. He told students and business people at the Gordon Institute of Business Science “there was a clear misalignment in the consultation process”. He then urged the mining industry and the mineral resources minister Mosebenzi Zwane to “go back to the drawing board”. ANC Spokesperson Zizi Kodwa says the ANC’s top six officials, including Ramaphosa, agreed to the document and cabinet — where he is leader of government business — also gave it the green light. Appealing to the GIBS audience, Ramaphosa sought to distance himself from those decisions, never explaining why he had agreed to the Mining Charter being gazetted and why he hadn’t objected to his claim of a consultation “misalignment”, in these meetings. In 2014, President Jacob Zuma, appeared to be handing Ramaphosa a poisoned chalice. He told him to ensure labour stability prevailed and to implement the ANC 2014 election manifesto’s promise of a national minimum wage. At the time, an acrimonious relationship existed between unions and business, strikes were commonplace and economists sneered that a minimum wage wouldn’t be possible. Almost exactly two years after the parties (government, business, labour and communities) agreed there was a need for a minimum wage, Ramaphosa seemingly pulled a rabbit out of his hat and announced they had agreed to R20 per hour or R3 500 a month, as a start. The social partners also agreed to amend the labour legislation which would allow for several recourses to end violent or lengthy strike action. People following the proceedings at Nedlac were incredulous as business and labour had remained far apart on the figure of the minimum wage. Ramaphosa appointed an advisory panel which combed through hundreds of pages of local and international research, before putting the R20 per hour figure forward as a proposal. Insider’s privy to the Nedlac process marvelled at Ramaphosa’s cool head and seemingly endless patience during the interminable negotiations. He’s been quick to point out that the R20 per hour is in no way a living wage, but one which covers 60% of workers who earn less than this currently and a figure that can be used to build towards a more equitable wage structure in the future. I’ve asked people if they felt his drive to succeed on the minimum wage issue would, in some way, compensate for turning a blind eye and remaining mum ahead of Marikana. “Possibly,” they say. The nine seconds of shooting in front of media cameras, which left seventeen strikers dead and the killing of seventeen other striking miners on the “small koppie” have fractured and destroyed many political careers and aspirations. Ramaphosa, who was previously emerged virtually unsullied, will forever carry a black mark next to his name. Then police commissioner Riah Phiyega, just three months into her job, spent her entire term fighting the damning accusations and findings and was later suspended. The police minister at the time, Nathi Mthethwa, was demoted to the arts and culture demoted. The minister of mineral resources Susan Shabangu, was moved to a portfolio she clearly has no interest in: the ministry of women in the presidency. The political earth also shifted seismically under the ANC, after Marikana. Its major ally, the NUM, lost significant ground to AMCU and the platinum belt became an almost no-go zone for the party. The Economic Freedom Fighters (EFF) launched itself as a political party in 2014, opposite the koppie in Marikana and repeats the message that the massacre proves the ANC has abandoned its core constituency, the working class. Ironically, twenty metres away from the infamous koppie itself — where heavily armed police officers were pictured crowing over their prey — not a single mark exists as a reminder of the seventeen men mowed down there. The black earth has been ploughed over, the cattle kraal which blocked the miners’ escape, has been moved. One small white cross lies discarded on the koppie illustrates the transience of life in the temporary shanty towns dotting the landscape. There are even fewer markings on the “small” koppie, or “killing koppie”, several hundred metres away, where police chased miners and killed seventeen of them, out of sight of the television cameras. Many were shot at very close range and at least one person with their hands in the air, according to the autopsy report. The Farlam Commission’s report, released in 2015, recommended a public memorialisation, but this is yet to happen and with the fifth anniversary approaching, the organisers of the annual commemoration are considering possible plaques or structures that will honour the dead. Ramaphosa has publicly promised to go to Marikana and apologise. As his enemies within the ANC beat the drums of war at the ANC’s policy conference, which continues this week, will he head to the dusty mining town, or will he rely on the paucity of public outrage in 2012, the Zuma and Gupta House of Horrors and his own easy charm, to once again turn his back on the mineworkers for financial and political expediency? Ramaphosa has been heavily criticised for bidding R19.5 million for a prize bull, which he later apologised for saying it was a mistake “in a sea of poverty”. I think there are many other events where his actions should face scrutiny, instead of this one. As a white person, it’s ridiculous to examine examples of conspicuous consumerism, when white people benefitting from their privilege have, for centuries, displayed their lavish wealth. I’m also not entirely comfortable with who decides what figure should be spent on which item. Is spending R54 on a smoothie, in a gentrified coffee shop, in downtown Johannesburg, also not done “in a sea of poverty”?